Heavenly Father, today we absolutely celebrate the return of all but one of the kidnapped Dapchi girls! We are so thankful that they are on their way to being returned to their families! Thank you, thank you, thank you! Bring healing on every level, not only for these young women, but for their families. 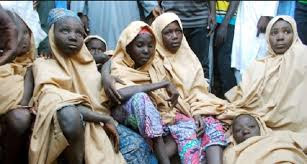 Now, Lord, we pray for 15-year-old Leah Sharibu, who remains with Boko Haram, allegedly because she refused to renounce her Christian faith. We are absolutely moved and amazed that this young lady is taking such a strong stand for you. We rejoice in her courage. Almighty God, we ask you to sustain that courage and uphold this young lady as she now goes on without the support of her friends. Please protect her. We pray that the government will be successful in negotiating her return. Bless Leah for her tremendous testimony. Grant her family the peace that passes understanding. And may the world know that the only true freedom is found in relationship with you. In Jesus’ name we pray, amen.